Heraeus demonstrates the use of infrared heat for additive manufacturing of metals. In addition to expertise in materials and processes, many factors play an important role in making additive manufacturing of metal components a success story. 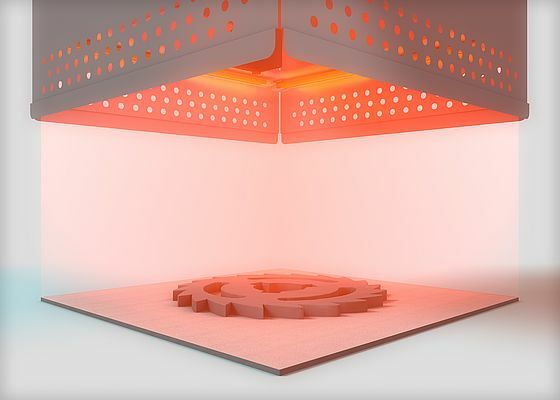 Heraeus Noblelight is developing innovative, efficient infrared heating technologies such as construction space heaters, which solve one of the most urgent problems of additive manufacturing: unwanted stress on materials during the printing of metal components. Heraeus offers a package with a full range of services, from consultation to simulation of heat distribution to provision of a customized infrared solution. In additive manufacturing—the layer-by-layer construction of metal components—preheating the powder bed is an important step. Infrared heat can be used for this purpose. The real benefit: Infrared emitters heat the metal powder in an especially homogeneous (i.e., uniform) manner, because the source of the infrared radiation can be precisely aligned with the construction space of the particular application, and precisely adjusted for the particular material with regard to performance, form, and wavelength. The result is an increase in the quality of the printed metal component. In addition to the type of powder material, the distribution of heat in the chamber is also a critical factor. Thanks to special simulation processes, Heraeus can determine the optimal heat distribution for a customer’s particular manufacturing equipment. Both development time and expenses are reduced in this way. In addition, it is possible to identify the causes of fluctuations in quality and the possibilities for optimizing critical production steps as regards energy efficiency and process quality, and to detect potential energy savings.